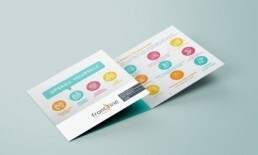 Frontline Training called upon the Emotive team when they needed a quick fire brochure created for a Careers Expo that they were due to attend. The promo piece needed to be both informative about course specific information and appealing and engaging to their youthful target market without compromising the clean professional Frontline brand look. 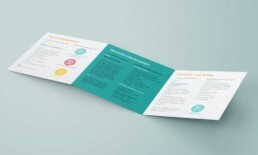 Going with a square format immediately made this brochure stand out from the standard clutter produced by other local education ‘institutions’. 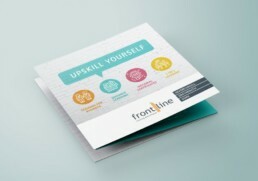 A suite of pictorial icons was developed to help tell the story of the benefits of upskilling oneself within the professional environment that Frontline provides. These brochures proved to be a hit with their prospective students – which was reflected in the increased interest in their courses and subsequent enrolment numbers during and since the Expo.